Anybody else just LOVE handbags? I adore a fun statement clutch, or a nice big bucket bag with tassels. Unfortunately, when you have a baby or toddler, you're kind of limited on what you can carry. You have to carry bottles, pacifiers, change of clothes, diapers, wipes, toys, snacks and mini first aid kits on hand all the time. Which is why those adorable handheld clutches are pretty much out of the question and impractical. Most moms opt for a diaper bag, because they're made especially for the storage moms need. They also have amazing compartments and pockets. It's just easier to throw a wallet and tube of chapstick in a diaper bag, than having to worry about a bag for your baby and a cute one for yourself. BUT diaper bags are often big and bulky. When you still need some items, but not the whole house, they can become quite cumbersome and unnecessary. Now that my son is 2, I have significantly less stuff to haul around than I did when he was a newborn. Granted, I was a first time mom and probably over packing, but nowadays I have a much simpler, more chic option for toting around my son and I's necessities. Hello tiny backpack! These little backpacks are PERFECT for moms with toddlers who still want a chic stylish "diaper bag" option. 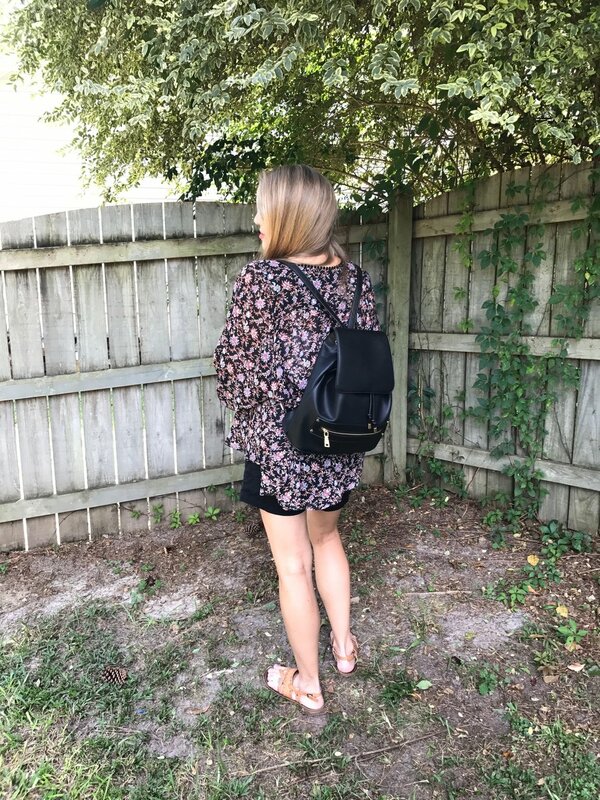 I've seen some of the backpack options that are advertised for moms, and they still seem too much like a diaper bag to me. They are bulky and big, they just have straps to wear on your back. They are also still pretty expensive, like traditional diaper bags. I was able to get my adorable mini backpack for a much more affordable price. I found mine at T.J. Maxx for only $35. And its even cute enough to be a "purse" verses a "school" backpack. They literally had 1 million colors and styles. But I wanted a black one that would go with everything, and that my son could even carry on his own if I needed him too. So far, I haven't had him wear it, but he could because it's not overly girly. It's pretty neutral. It goes so well on all of our adventures. I also like being hands-free with him, because I have to grab him pretty quickly or carry him. It's just easier and more comfortable if you have a backpack! I also specifically chose this backpack because it has a full back zipper. It slides down all the way so you can easily get into your bag. I don't have to open the top to get what I need. I literally don't even have to take the backpack off to get into it, which is super cool! I have easy access to his sippy cup, hand sanitizer, or diapers and wipes. It's so perfect for park dates, city adventures and like I said it goes with pretty much everything! You could not go wrong with a backpack like this, especially with how affordable it is! I also found the perfect crossbody. I am very particular about the size of my crossbody handbags. They can't be too small, because I have some large items that need plenty of space. They also can't be too big, because if I have to wear them while walking around with Silas, I don't want it to feel like a chunky purse. So, it took awhile till I decided on the perfect one. I found this Nine West crossbody at T.J. Maxx too. They are in no short supply of black handbags, but this one was the size, price and quality name brand that I was looking for. Can you believe I only paid $25 for this original $70 handbag? It's just a basic black bag, why do I care what season it is? Such a great deal, and it's a classic piece that will go with many outfits, for many seasons to come! Hope all you mamas out there found this post helpful. I like to think outside the box when shopping for baby/maternity things. T.J. Maxx is very affordable, and has good quality items for less. I never said I didn't like to have nice things in life, I just don't like to pay full retail value for them!